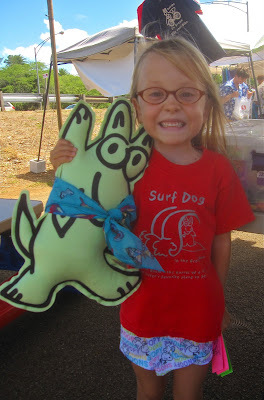 Here I am with Lily at my booth at the Haleiwa Farmers' Market. She's a 2nd grade student at Sunset Beach Elementary. Lily is a famous surfer on the North Shore of Oahu, sometimes she even announces at the surf contests. She's a brilliant speaker and a terrific reader. Lily will be competing at the Menehune Surf Contest in Haleiwa starting on October 15th. Come and watch her rip!